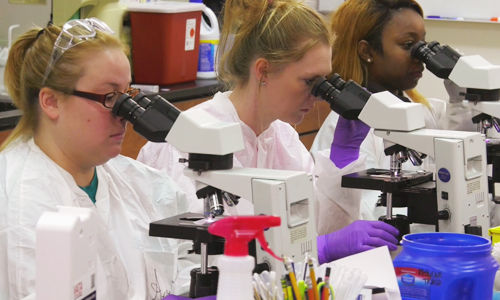 The MLT (Medical Laboratory Technician) program offers an Associate in Applied Science degree from Calhoun Community College which prepares graduates for eligibility for National Certification Examination in Medical Laboratory Science. The Calhoun MLT program has been accredited by NAACLS since 2010. WHAT IS A MLT (Medical Laboratory Technician)? The medical laboratory professional is qualified by academic and applied science education to provide service and research in clinical laboratory science and related areas in rapidly changing and dynamic healthcare delivery systems. MLT professionals perform, evaluate, correlate, and assure accuracy and validity of laboratory information; direct clinical lab resources and operations; and collaborate in the diagnosis and treatment of patients. MLT professionals practice independently and collaboratively; possess excellent oral communication skills to engage in consultative interactions with members of the healthcare team, customer service and patient education; and demonstrate ethical and moral attitudes and principles that are necessary for gaining and maintaining the confidence of patients, professional associates and the community. The ability to relate to people, a capacity for calm and reasoned judgment, and a demonstration of commitment to the patient are essential qualities. Contains current policies and procedures. Each new cohort will be given an updated Handbook. Data tallied from the most recent past 4 years. Receipt of completed application for Medical Lab Technology Program by deadline listed on current application. Meeting the essential functions required for MLT.